The decoration of our house, the tin box, is to be found outside, not inside. The finger-like evergreen branches of the surrounding teak trees provide us with year-round sun parasols. They are painted with sprays of dainty purple flowers and countless species of woodland birds–kingfishers, sunbirds, paradise flycatchers, weavers, babblers, drongos, the list goes on–who appear unswerving in their desire to serenade us with song. From dawn, when they wake us, to dusk when they say their goodnights, during our sundowner, we are always accompanied. 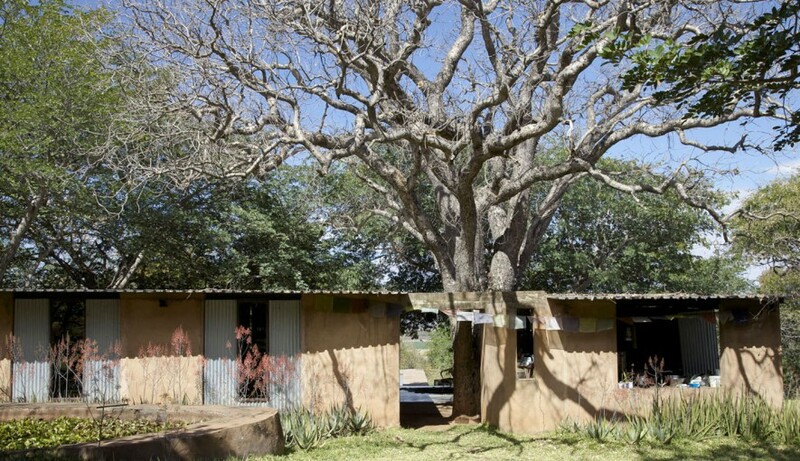 Then, at the end of summer, the Mongongo tree that umbrellas our house offers up baskets of nuts, throwing them down onto the sheet metal roof like an offering from Mars, the God of War. In May this year we collected up its bounty and I started experimenting with the nuts in the kitchen. I will be sharing my recipes with you as and when I am satisfied with their outcome, but for now these musings on our simple existence, lived so close to the natural world, led me the other day to a cookbook given to me by my mother some years ago. The Kenya Settlers’ Cookery Book and Household Guide was that country’s equivalent to America’s The Joy of Cooking, and Britain’s Constance Spry’s Cookery Book. The 334-page book, with its damaged spine and navy leather cover that looks like a bird has pooped on it, was first published in 1928. Mine is the 12th edition, published 30 years later, not long before my mother became a young bride in Nairobi. The first line of its Preface resonated with me when I read: “Many difficulties were encountered by homemakers of East Africa during the early part of the century: ingenuity and improvisation were necessary when feeding a family and making a home.” … Although we don’t have to rely on hurricane lamps and wood stoves here–we have a mostly-working electricity grid–one has to be creative, be it finding a way to avoid serving a battalion of bugs that were earlier attracted to the light above your chopping board, or trying to roast a lamb on an oven rack that keeps collapsing because it can’t handle the weight. The declaration in these parts, “let’s make a plan!” is ubiquitous. That’s because we don’t have a choice. Black–the oven is too hot. Deep brown–the oven is very hot. Golden brown –the oven is hot. Light brown–the oven is moderately hot. It is filled with lots of other useful advice like how to boil an egg properly–it’s an art, don’t you know? The higher the altitude the lower the boiling point, and a new laid egg takes less time than an old one, etc. It has a broad range of hints: what you need when going on safari, how to remove hot water marks from a polished surface, what to feed your children (the American government would do well to find itself a copy), or how to utilize milk that’s turned sour. Did you know that scone-making, salad dressing, pancakes and junket–something else I was “allergic” to at boarding school–all benefit from using sour milk? Chris and I actually buy a version of curdled sour milk called mabisi. For its probiotics he just glugs it down straight from the bottle before adding some to the dogs’ supper. I need to mix it with something tasty, usually pomegranate juice or runny honey, which makes a yogurt-like smoothie I drink with breakfast. 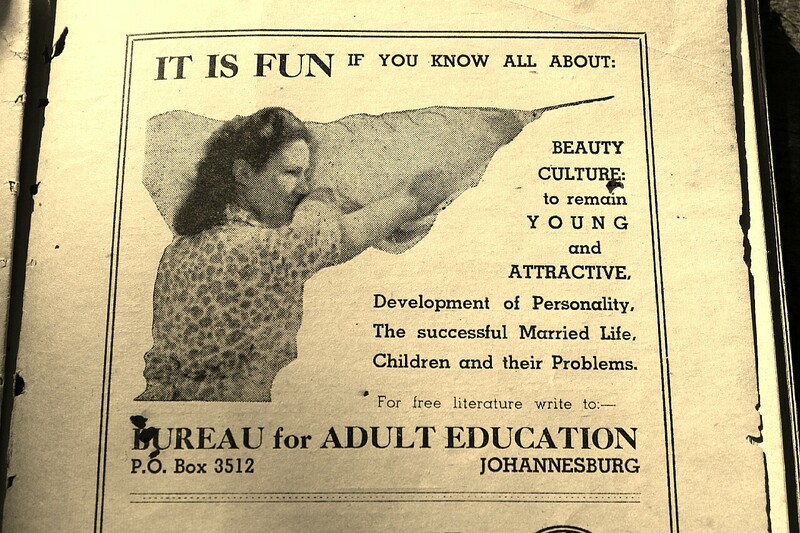 I leave you today with an advertisement for the Bureau for Adult Education which I found in the South African recipe section of the book. Clearly, adult education in 1958 South Africa was very different to adult education today. Thank heavens. Shame..loved the Kenyan cookbook pic…amazing that you have it….your poor ma and all the women of that generation. Makes me think of the song “Keep Young and Beautiful if You Want To be Loved.”.1933 from the movie ROMAN SCANDALS. I hope times have changed or have they ?? I like to think they have, Helen, but sometimes I wonder! How I would love to read the literature from the South African Bureau of Adult Education in 1958. Bet it was a hoot! Indeed … although how “educational” it was is probably quite subjective! I love the how to tell if your oven is too hot tips.